Chorley boss Jamie Vermiglio is hoping to create history tonight by reaching the second round of the FA Cup for the first time since 1990. The Magpies travel to the Keepmoat Stadium to face Doncaster Rovers in a replay, after a 2-2 draw at Victory Park last Sunday. And, with Charlton Athletic or Mansfield Town – who also replay tonight – lying in wait, Vermiglio admits he can’t wait for what could be a memorable night. 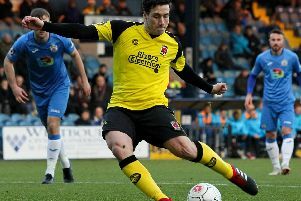 Around 500 Chorley fans are expected to make the journey across the M62, and Vermiglio said: “We are excited – excited for the players, who will get the opportunity, excited for the fans. We had sold 500 tickets last time I checked. “It is a good experience, but we are not going there thinking we are going to be beaten. Chorley will, however, be without four key players at Doncaster, after Kieran Glynn was recalled by Salford City, while Matt Challoner, Elliot Newby and Mar cus Carver are suspended. Vermiglio has hailed the patience of Jake Cottrell, with the midfielder set to step into the side. Since the arrival of Newby and Glynn, the 30-year-old has only made six starts, having been a regular for six seasons.